I COULD HAVE BEEN A WINTER OLYMPIAN! Last week was terrible. The stock market fell by about a million points, the Federal Government shut down for the second time this year, and I had emergency surgery! But I’m back home now, and this week has been a good one. As I recover from my recent surgery, I am sitting in my lounge chair in front of my big screen T.V. watching the Winter Olympics from Pyongchang, South Korea. And if you can pronounce “Pyongchang,” you deserve a gold medal in linguistics. As I watch such diverse Winter Olympic events as short-track speed skating, men’s doubles curling, and the biathlon (the official winter sport of the National Rifle Association), it has occurred to me that I should have been a Winter Olympian. That’s because as a child I was pretty competitive in winter sports. Since I was born and raised in Elvis’ hometown, (“Meh-fus,” as Elvis would say it), I could only participate in winter sports one or two days a year. That’s because then and now we get snow in Memphis on, at most, one or two days a year. But when I was a boy, I took advantage of snow days to head outdoors and play with other kids in the neighborhood in our own version of the Winter Olympics. We couldn’t do any downhill skiing, since Memphis has no hills to ski down. (Mount Moriah does not have a ski slope.) But we had our own bobsled competition of sorts sledding down icy streets. We also engaged in what you might call “curling hockey,” using broomsticks as hockey sticks as we hit a small rubber ball into makeshift goals on the frozen streets. We would borrow (okay, steal) plastic trays from Smokey’s Palace, the cafeteria in the student center. We would then take the orange trays to the top of the iconic “Hill” and barrel down the hill on our tray sleds at breakneck speeds. Invariably, as the temperature rose on relatively mild winter days in Gatlinburg, the “snow” would turn into thick wet ice. It was like skiing on top of a Slurpee. But in all immodesty, I got pretty good at it. If they ever create a Winter Olympic event that combines downhill skiing and figure skating, I’ll be pursuing a medal. Yes, I could win a gold medal in Slurpee skiing! Well, if you’ll excuse me, I’ve got to get back to the Olympics. They are about to start the finals of mixed doubles ski jump! They’ll combine the beauty and grace of figure skating with the agony of the traditional ski jump crash! I never did a ski jump on my snow days as a child in Memphis or a college kid in Knoxville. But I did soar a few times while ice skiing at Ober Gatlinburg. Not on purpose of course. I hope that at the 2022 Winter Olympics in Bejing there will be a new event ... the plastic tray luge! If so, I will be there competing for the gold! 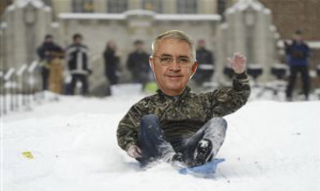 Frank Crawford: I remember those snowy days on the Hill as well, and I took many a slide on the orange cafeteria trays - and almost broke my back hitting a high concrete curb backwards at the end of a greased lightning slalom downhill from the steps of Ayers Hall. How I walked away from that I will never know.